My Fiancée (Eileen) and I reached the race site (The Float@Marina) in the early morning Sunday at 4:30am. 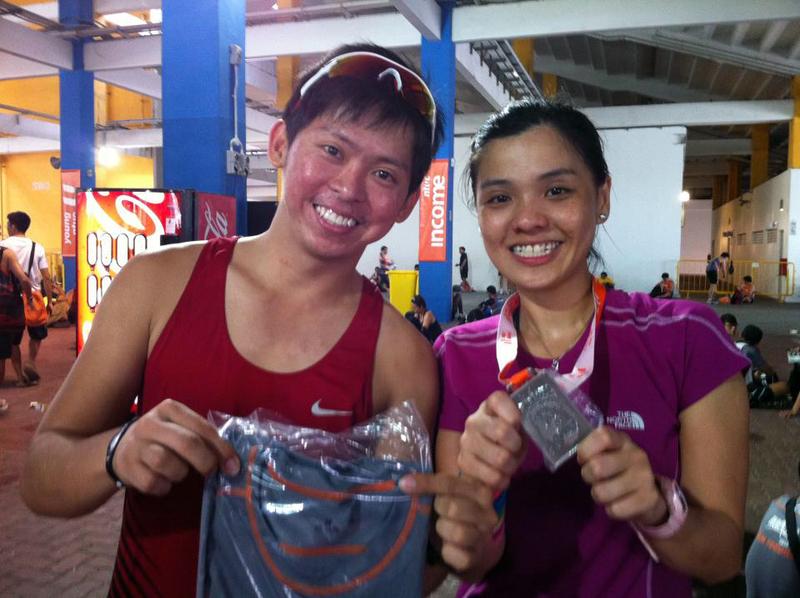 It was her 1st half-marathon race in her entire life. 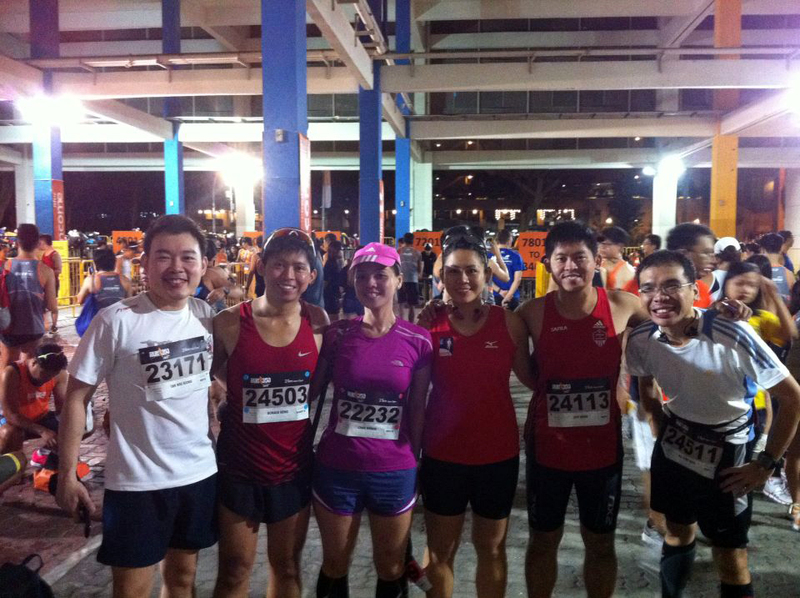 Initially, Eileen was worried that she could not finish her 21 km race as she did not do any race more than 10 km distance. However, I told her that she was going to make it to the finish line as she had LSD trainings with us (Freedom Freaks) previously and had increased her longest distance mileage to about 25 km. 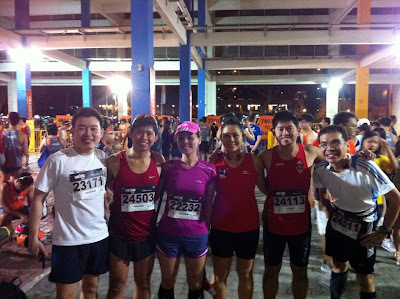 Before the race was started, both Eileen and I linked up with Jeff, his girlfriend (Yingshan), Chee Wah and Jeremy at the baggage deposit area. 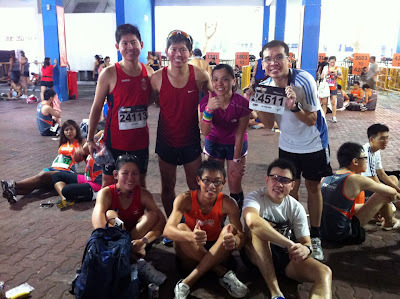 After depositing our stuff at baggage counter, we immediately did our warming-up & stretching exercises and then heading to the 21km start line. Near to the start line, I met up with bro Izat and wished him all the best in his race. 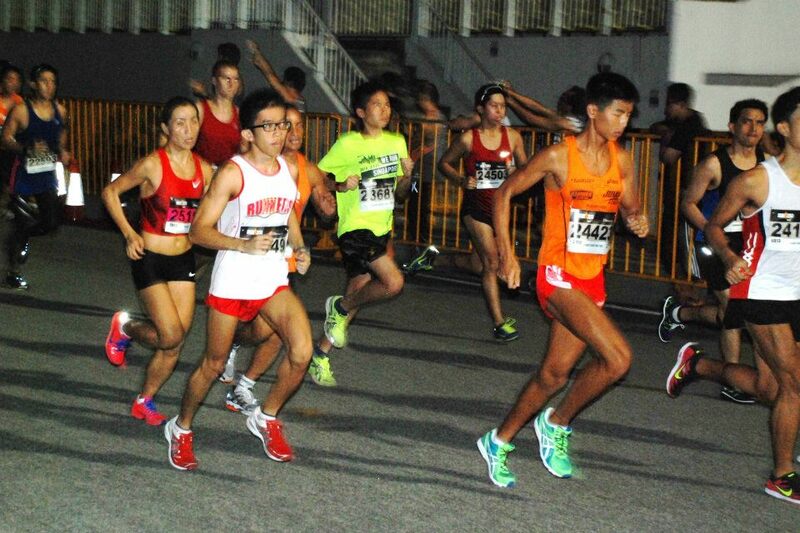 I told him that he sure can finish his race in sub-1:30 hour due to the recent's improvement in his training at MacRichie Reservoir with Sam E, Yaoming, Asree, Izhar and other FF runners. Bro Izat then asked me for my target time. I replied to him that sub-1:40 hour would be good enough for me because I had been putting on weights this year and also did not do much LSD trainings with FF runners. Hence, it was quite unlikely to do a new PB time for me, I thought so. 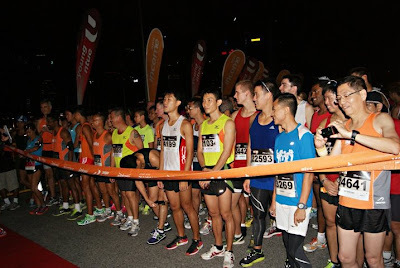 At the start line, I felt privilege to position myself together with our well-known Singapore elite marathoners like Ashley Liew, Anne Date, Ivan Low, Izat and other fast runners. Soon, the 1st wave of 21 km race was flagged off at 6:00 am sharp. Izat bro was then immediately flew off like an rocket. Cool right? Hahaha! I ran and met up with Anne Date during my 1st km run. 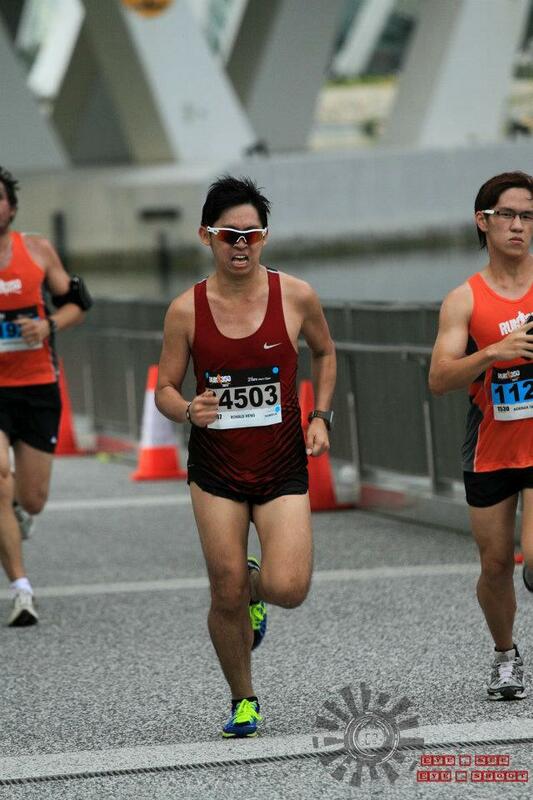 To make myself feel like an elite runner in that competitive race, I then quickly speed up my pace and ran beside her. Hehehee! 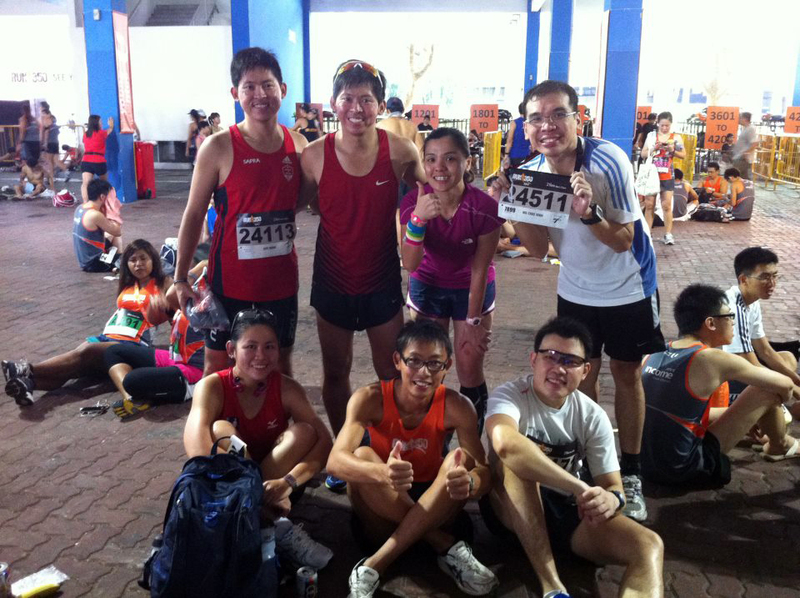 At that time, we were running together at a pace of 3:43 mins/km. But I told myself that I should not push too hard above my usual pace/speed from the start because I would easily hit my wall early and eventually slowed down my overall performance. Hence, I began to slow down my current pace to about 4:30 mins/km and kept focus on my run with a steady and comfortable pace. Throughout my run, I managed to hit my objective timings for the various distance markers (5km in 21m 55s, 10km in 45m 38s and 15km in 1h 09m 19s) and finally I crossed the finish line with a new PB time of 1h 37m 09s (average pace 4:37 mins/km). 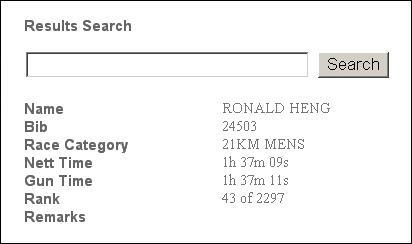 That was 3 seconds faster than my previous PB which I achieved in SAFRA Army Half-Marathon 2011. 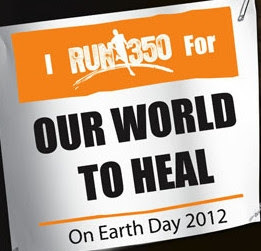 My overall rank position was among top 50 finishers, that is, 43 out of 2997 runners. Honestly speaking, the feeling was awesome! My upcoming races in May 2012 are MetaSprint Series (Triathlon), Trifactor Swim 1.5 km and lastly Sundown Marathon 42km. Hope things will be fine and go smoothly. Safety always comes first and timing comes second.